In my previous article, I have explained jQuery Datatable server-side pagination and sorting. In this example, We will implement custom multicolumn server-side filtering in jQuery dataTables. By default jQuery Datatable provides a global search box for filter records and that is applied on the whole table. But here in this example I will show how we can remove the default search box and add our own custom search area with input fields(input, select etc) for implement custom multicolumn server-side filtering in jQuery dataTables. In this way, we can also place our search fields anywhere in our page with no restriction like jQuery DataTables default search box. Part 1: Implement jQuery Datatable (Basic initialization) in ASP.NET MVC application. Here I have added a database for store some location information in our database for show in the google map. Here I will create 1 table (as below) for store data. Here I have created a controller "HomeController"
Step-6: Add new action into the controller to get the view where we will implement jQuery DataTable with server-side paging and sorting. Step-7: Add view for the action (here "Index") & design. 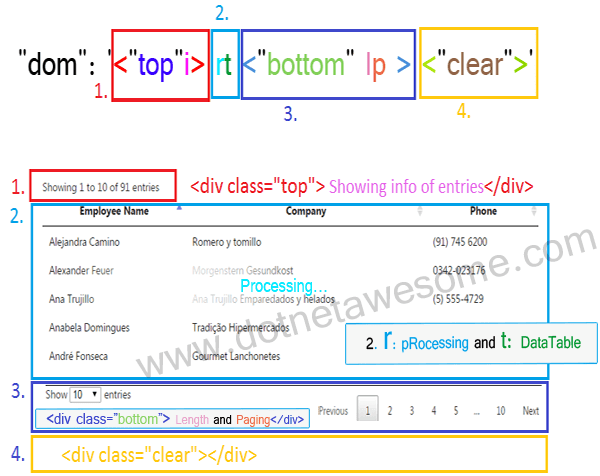 @* Here I have made this select box with some static data for make this example simpler. If you already implemented Part 2 of this series, you can see here I have just added 1 extra line in the jQuey DataTables initialization code. I have added this line for hide default global search box. This initialisation variable allows you to specify exactly where in the DOM you want DataTables to inject the various controls it adds to the page. Go to Solution Explorer > Right click on References > Manage NuGet packages > Search with "System.Linq.Dynamic" > Install. Step-9: Add another action (here "LoadData") for fetch data from the database and implement logic for server-side paging, sorting and filtering.